I love me some zombies. And I always appreciate the hangman's humor in any "The End of the World as we know it" type of story as I am pretty sure that is how I would handle it. I really do like the narrative voice of the main character, Michael Talbot. As a military guy I can relate, and the really funny bit is that Mike is a zombie fan in the novel. So unlike some stories where apparently all the characters are dumbfounded that zombies exist, with no knowledge of the lore and stories that surround them (no modern novel should have character that are too shocked by zombies, they are too prevalent in US pop culture). Mike even experiences the moment of giddy, "It's real! It is really happening" before the reality hits him and it becomes "It's real?!? It is really happening....... crap. We are screwed." Overall the story flows pretty well, from the initial outbreak (damn flu shots....) to the desperate battle to protect his family. It does introduce some likable or interesting characters, but given this is a zombie story do not get too attached to any of them. 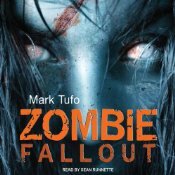 The author does decide to bring in a mystical capability on both one of the characters and on at least a few of the zombies that made some of the story a stretch, but overall it didn't hurt the story too much (though it made for a some convenient outs for the near terminal situations that author painted the characters into). Fun read, and also funny. Given the title it sounds like there may be some more story left from the remaining characters so I would be interested to see where this may go. Hi Daniel, Appreciate you taking the time to do a review it is much appreciated and obviously I'm glad you liked it. As for more stories...I'm currently writing ZF6 which is due out in October. Again thanks!